To celebrate the release of the 1921 Canada census, GENViewer and GENMatcher will be retailed at the excellent price of whatever you want to pay through Thursday, August 25, 2013. I urge you to think about how much it is worth to you. Where else could you buy professional-quality software like this for less than 20 dollars? GENViewer - adds more functionality, searching, and views of your Legacy family file. Click here to add GENViewer to your shopping cart. Enter your purchase price in the Each field (normally $19.95). Click on the blue Recalculate button. Click on the yellow Proceed to Checkout button and place your order. Or click here to first learn more about GENViewer. GENMatcher - quickly compares your Legacy family file to other genealogy files for possible matches. Click here to add GENMatcher to your shopping cart. Or click here to first learn more about GENMatcher. I just found this brief video about using the FileSearch feature in GENViewer - one of its best features. To celebrate Labour Day, GENViewer and GENMatcher will be retailed at the excellent price of whatever you want to pay through Monday, September 3, 2012. I urge you to think about how much it is worth to you. Where else could you buy professional-quality software like this for less than 20 dollars? To celebrate our 12th year of Mudcreek Software, GENViewer 1 and GENMatcher 1 will be retailed at the excellent price of whatever you want to pay through Thursday, February 23rd, 2012. I urge you to think about how much it is worth to you. Where else could you buy professional-quality software like this for less than 20 dollars? GENViewer and GENMatcher, two of Legacy's add-on programs, are now 50% off for the month of December. Normally priced at $19.95, these remarkable add-ons are now just $9.95 each. To learn more about GENViewer click here. To learn more about GENMatcher click here. GENMatcher is a Windows-based utility that compares two genealogy files for matches, or one genealogy file for duplicates. GENMatcher quickly finds matches between genealogy files. This allows you to quickly test downloaded files for potential matches to your data. In addition, GENMatcher also helps you clean up your genealogy data by finding duplicates. You can compare files between different file formats. Files do not have to be the same format to be compared. 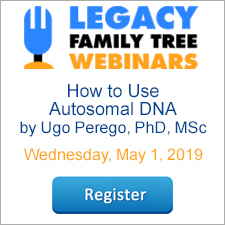 GENMatcher reads and compares Legacy Family Tree and PAF family files, as well as GEDCOM and Temple Submission Files. GENMatcher lets you set the comparison criteria. Your analysis work is saved in work sessions. An unlimited number of sessions can be saved and restored. Use GENMatcher with no risk to your data. GENMatcher compares without modifying your data; there's no need to import data to compare files. System requirements: GENMatcher runs on Windows 95/98/Me/NT/2000/XP. It requires 5MB of disk space. 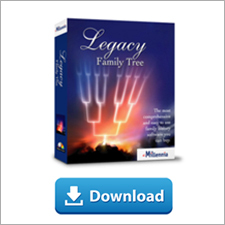 Visit http://legacyfamilytree.com/GenMatcher.asp to learn more or to purchase GENMatcher Legacy Edition.